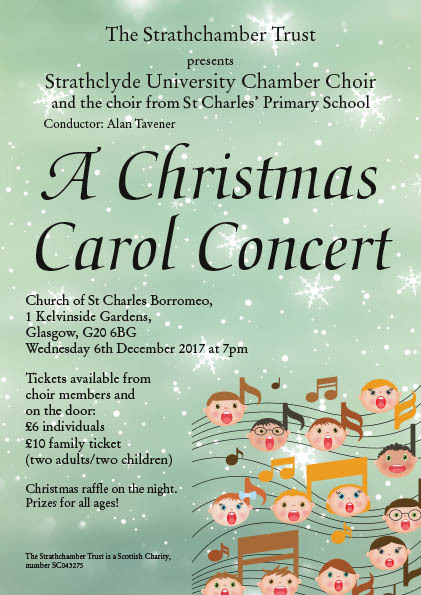 Our Christmas Concert was a musical collaboration with the voices of St Charles’ Primary School choir, in the wonderful acoustic of their associated church, St Charles Borromeo in the heart of Glasgow’s West End. The programme comprised a rich festive fusion of well-loved favourites, uncovered classics, and vibrant new works. The evocative harmonies of Arthur Sullivan’s O Hush thee my Babie provided poignant contrast to close harmony arrangements such as Santa Claus is coming to Town and energetic pieces such as the Czech Zither Carol. Modern classics such as Eric Whitacre’s luscious Lux Aurumque are a real favourite for choir and audience alike – and the richly evolving harmonies of the piece hung beautifully in the air, benefitting from the expansive acoustic of St Charles’. 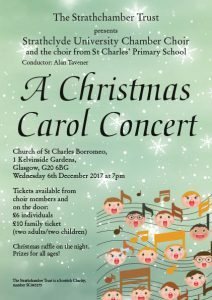 The programme also took time to acknowledge that Christmas is not all parcels, crackers and tinsel: we were particularly proud to perform the world premiere of a work by local composer Alan Craig, composed specially for the choir. A Refugee’s Lament is a powerful and haunting setting of words by David Farr, reflecting on the harshness of life for those fleeing war and conflict. A live recording of this premiere is available – simply click on this link. Inevitably, the choir was thoroughly upstaged by the children’s choir – who received their own hearty ‘curtain call’. A great end to the 2017 choir year. 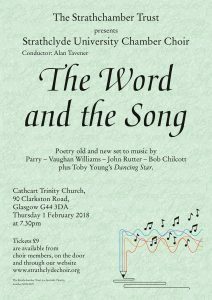 Look out for our first concert of 2018, on 1st February in Cathcart Trinity Church. 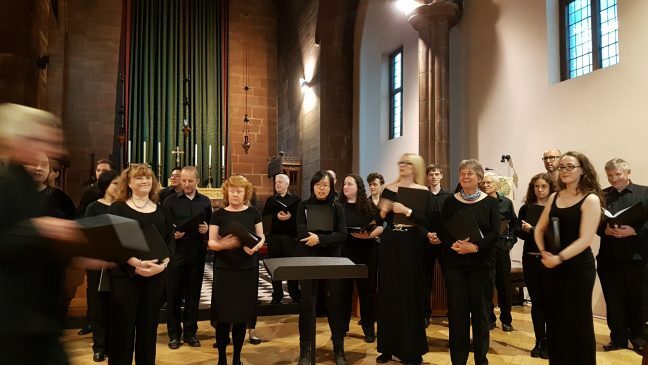 Strathclyde University Chamber Choir drew its concert season to a close last Friday with a capacity audience at the West End Festival in Glasgow. 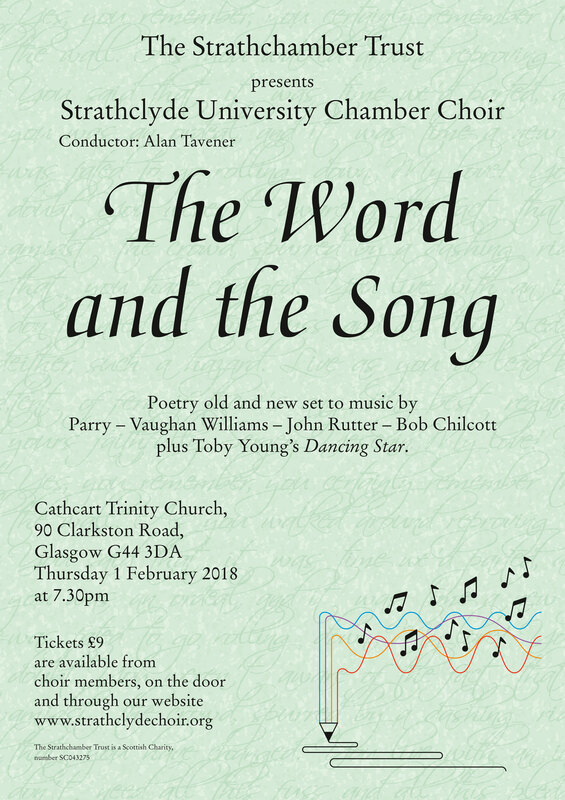 The concert embraced the theme of ‘the dance’ – with an evocative counterpoint of traditional and modern madrigals, and a glorious Bach motet.